Hi, Folks! Hope everyone’s enjoying cooling down a bit from last week. I spent the weekend in Vermont with a friend for her bridal shower, while Wes labored away here in the fields. I did make sure to check out the Montpelier farmers’ market, though, to investigate what farmers up there have to offer right now–all sorts of greens, some radishes here and there, and some beets. Naturally, they have a cooler growing zone and are thus a little behind us in terms of production, but yet it is still astounding how far ahead we are in terms of what we are harvesting right now. This week we have some typically summer delights that we are looking forward to giving out to you all. 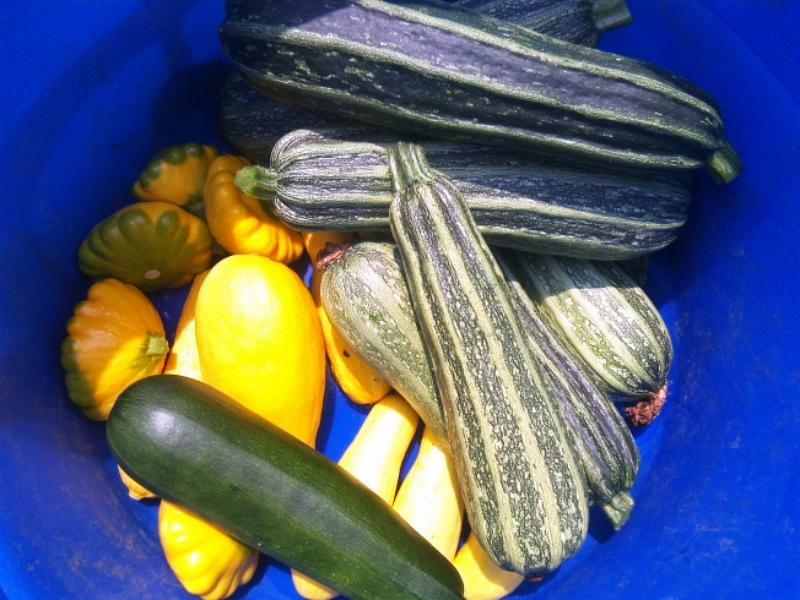 This week’s share is quite large, due to a fine combo of factors accelerating some veggies’ ripening! We hope the size isn’t intimidating to anyone. Ninety percent of the time, we eat squash the simplest way possible next to eating it raw, which you can do if it is a smaller squash. Just slice it up into 1/2 inch slices (cut again into half-moons if you like), and steam in a steamer basket or simply boil a small amount of water in the bottom of a pan–just about covering the bottom and a little more, but not enough to cover the squash–and toss in the squash for about a minute. Scoop it out and drizzle with balsamic vinegar, then sprinkle with a little salt. Add any other spices you like, such as red pepper flakes. Cook green beans in a small amount of water until they are tender and crisp, about 5-10 minutes. Drain. In 2 Tblspoons olive oil saute the minced garlic and slivered almonds. Add cooked beans and season with salt and pepper. Sprinkle with Parmesan cheese. That’s it for this week! See you at distribution. 1. Cut broccoli and cauliflower into bite size pieces; I even like to dice the stems into small pieces. (if you want, you can blanch them, but I like this crunchy!) Add one finely chopped red onion. 2. In a separate bowl, completely mix one part vinegar (I like to use rice vinegar), one part sugar, and two parts mayo. Add salt & pepper if you like. 3. Pour over broccoli,cauliflower,and onion. Mix completely and refrigerate overnight. Stir to coat veggies with marinade. This salad will continue to soften and only tastes better as it sits. Great as a side dish, on a salad plate, or all by itself. You can adapt this to use any “firm” veggie combination you have on hand and like, just be careful to combine veggies so as to not make the marinade too watery as it sits.